BenQ W1060 review | What Hi-Fi? Whether it be a low resolution or some other gaps in specification, budget projectors have tended to compromise too much on performance. 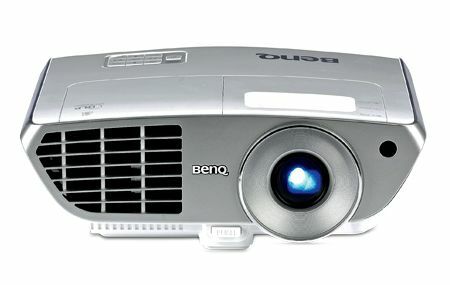 The BenQ W1060 aims to buck the trend, despite its low price: it’s a Full HD, 1920 x 1080-pixel DLP projector. The white chassis is compact and seems solidly put together. Lens and zoom are controlled manually, while there are adjustable feet to get the picture position just right. There’s a pair of small speakers in the projector if you want sound direct from the source, and a carrying case means you can cart it around and just add a source for an on-the-fly system. BenQ W1060: Picture qualityX-Men: First Class is a fine test disc, with a good mix of dark and bright scenes, fast motion and punchy colours. And the BenQ does pretty well. The colour balance is natural, with refined colours. Black levels are admirable, though the very trickiest dark scenes lose a little solidity and insight. Skin tones are presented faithfully and there’s good detail, although there’s the odd hint of noise in blocks of colour. Fast motion is rarely perfect even on more expensive projectors, so it’s no surpise there’s the occasional blur with rapid action, but overall motion handling is smooth enough. You can’t expect the world from a £700 projector, and the BenQ W1060 doesn’t have us throwing away our favourite £1500 projectors, but for those on a tight budget this is a solid effort with no glaring faults.